I will be listing a large quantity of toys over the next few weeks. Nice large 14.5 long Tomiyama of Japan tin friction Indy style open race car toy with original box that was imported by Cragstan. This car looks as though it was never played with and the litho is still super clean and glossy with almost no wear, there is one scratch down the right side beneath the driver. The car is all tin with vinyl rubber driver's head, and inflatable tires. It features friction rear wheels that still work great with clicking engine sound, the 4 inflatable and removeable tires, 1 spare tire with patch, plastic pump (with hose broken off and missing but the nozzle end is still here) and it is missing the wrench and 1 nut to hold on the front left wheel rim. It comes in the original box with nice graphic of the racer zooming across the lid. CONDITION: The car is in glossy condition with very little wear and no dents, 1 scratch down the right side under the driver. The friction still works great. The hose is broken off and missing from the air pump but the nozzle is still there, the wrench is missing, along with 1 nut for the left rim. The box has some tears, creasing, and edge wear to the lid as shown, and a piece of the side of the box lid is torn off but present. Get Supersized Images & Free Image Hosting. Attention Sellers - Get Templates Image Hosting, Scheduling at Auctiva. 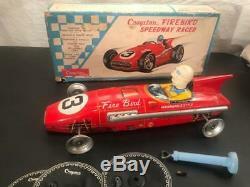 The item "1950's 60's Cragstan Japan Tin Friction Toy Firebird Speedway Race Car & Box" is in sale since Thursday, October 11, 2018. This item is in the category "Toys & Hobbies\Vintage & Antique Toys\Tin\Vehicles". The seller is "treasuresof-yesterday" and is located in Webster, New York. This item can be shipped worldwide.